Following the ASN presentation, acting division head for Nuclear Safety, Licensing & Environmental Protection Joëlle Elbez-Uzan, (center, on the video screen) answered the questions from the public. Since January 2012, the French Nuclear Safety Regulator (Autorité de Sûreté Nucléaire, ASN) has performed five inspections of the civil works on the ITER construction site. 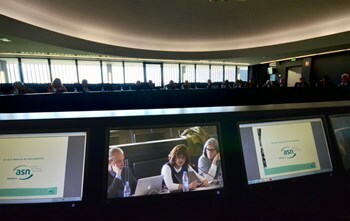 Last Thursday 30 May at ITER, the results of these inspections were presented to the participants in the plenary session of the Local Commission for Information (CLI)—the citizens watchdog group that monitors ITER activities in accordance with the French 2006 Transparency and Nuclear Safety Act. ASN considers that the organization of the ITER worksite is robust and efficient. In 2012, however, the Regulator noted that there was still room for improvement in the management of "non-conformities"—the small and inevitable deviations from blueprints that occur in construction works. On a few occasions last year ASN observed that the "notification process" from the moment a deviation is identified by the contractor until a non-conformance report is processed by the ITER Organization needed to be optimized. Following this remark, the ITER Organization took the necessary measures to ensure that procedures are observed throughout the chain of suppliers and contractors. In its last inspection to date (25 April 2013), ASN noted "a real improvement of the principles adopted and imposed by ITER [to its contractors] in the management of non-conformities." Although it is not an obligation, the ITER Organization has accepted that one or two CLI members be included as "observers" in one of the upcoming ASN inspections. Both the ASN and the CLI expressed their appreciation to ITER Director-General Osamu Motojima for this expression of the Organization's commitment to openness and transparency. ASN will continue to scrutinize the ITER installation throughout its lifetime and into dismantlement.